Globatech Australia is in development of a number of different products in a number of marketplaces. Below is a list of some of these products. Contact Us today for more information on possible products for your range or developments you are interested in pursuing. Ultrasonic Antifouling is the process of propagating ultrasonic frequencies through the hull of a vessel using powerful Transducers mounted in strategic locations throughout the inside of the hull. The process works by splitting/destroying the cell wall of small algae within a couple of inches of the hull which in turn prevents growth of larger organisms in the immediate vicinity of the hull. 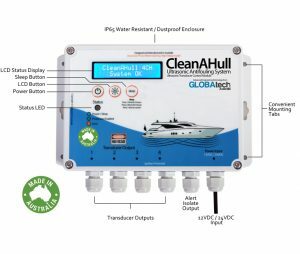 The CleanAHull System is the current market leading product and provides many advanced features that revolutionised the industry including Current monitoring, Active channel control, Thousands of carefully tuned frequencies for improved protection, improved transducer design for up to 30% more output, automatic 12 or 24V DC operation, active temperature compensation and many more features. The nature of this technology lends itself well to adoption into industry for sea growth prevention and algae control in large bodies of water, Globatech Australia is in development of solutions for other industries. Contact Us for more information on how our Advanced Ultrasonic Anti Fouling systems can benefit your business, industry or product range. 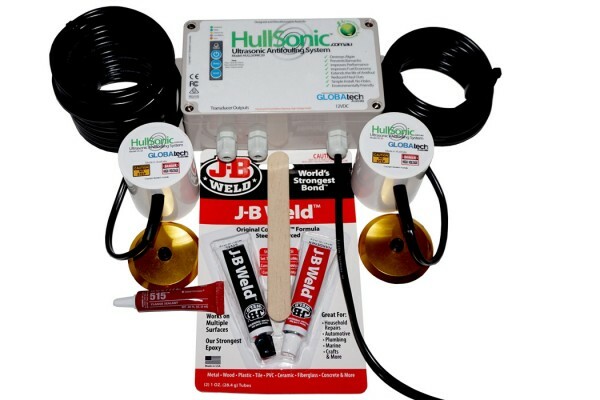 HullSonic Ultrasonic Antifouling provides the most cost effective and environmentally friendly anti-fouling solution available! Ultrasonic energy is used to prevent algae and bacteria from forming on your hull, running gear, sea strainers and more while the microscopic cavitation bubbles formed at the surface provide a “scrubbing” effect maintaining a clean hull. The low maintenance application of HullSonic Ultrasonic Transducer technology coupled with the environmentally friendly functionality provides the best low operational cost solution for bio fouling prevention. CleanAShine is a range of advanced products for Marine, Automotive & Metal Finishing applications. We ship and distribute our Quality Products direct and through a network of Resellers Worldwide. CFS – Clean Flush Soak is a range of Australian made products for Cleaning, Flushing and Soaking parts and systems for the removal of lime, rust, calcium, mineral deposits, uric scale, clogs, blockages and much more. For use in industries from Marine to Food and Beverage production to the descaling and cleaning of HVAC systems. Developed by Globatech Australia the CFS brand is a fast growing industry benchmark in Descaling and Cleaning solutions. The H2oBioSonic™ Ultrasonic Bio-Fouling prevention system comes from years of development in the Marine industry with the CleanAHull Antifouling system, along with in house development and testing throughout the world in real world environments. Globatech Australia is the world leader in Ultrasonic Bio-Fouling prevention technology. We utilise our own advanced algorithm tested and developed for the industrial applications that provides the highest level of protection possible. We also developed our !BLAST! function for added protection in some of the more harsh environments and installation configurations. The nature of this technology lends itself well to adoption into industry for sea growth prevention and algae control in large bodies of water. Contact Us for more information on how our Advanced Ultrasonic Anti Fouling systems can benefit your business, industry or product range.